Azerbaijani people in North America immigrated from several countries (Azerbaijan, Iran, Russia, Turkey) since the 1940s and are thus a people with a mixed ethnic descent. Over the years, they migrated for reasons of fleeing war in their homeland or pursuing better economic opportunities. Their historical background derives from both Turkic and Persian descent. Around 70% of Azerbaijani are Shia Muslims mixed with a secular lifestyle. As their dominant religion, Islam reinforces their people group identity along with their folk music, popular culture, and food. Their folk-based music, known as mugam, has gained popularity in recent years. Beyond the variety of soups and kebabs, Azerbaijan’s most distinctive dish is the plov, a saffron rice-based dish which is traditionally accompanied with a variety of herbs and fresh vegetables. Pray evangelical Christians will intentionally engage the Azerbaijani with the message of Christ. 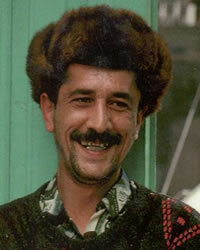 Pray that evangelical Azerbaijani will boldly share Christ with their own people. Pray God will work in the lives of Azerbaijani to experience a personal relatonship with the ultimate and intimate living God.